After nearly two decades in Britain, Bill Bryson took the decision to move back to the States for a while, to let his kids experience life in another country, to give his wife the chance to shop until 10 p.m. seven nights a week, and, most of all, because he had read the 3.7 million Americans believed that they had been abducted by aliens at one time or another, and it was thus clear to him that his people needed him. But before leaving his much-loved home in North Yorkshire, Bryson insisted on taking one last trip around Britain, a sort of valedictory tour of the green and kindly island that had so long been his home. His aim was to take stock of the nation's public face and private parts (as it were), and to analyse what precisely it was he loved so much about a country that had produced Marmite, a military hero whose dying wish was to be kissed by a fellow named Hardy, place names like Farleigh Wallop, Titsey and Shellow Bowells, people who said 'Mustn't grumble', and Gardeners' Question Time. 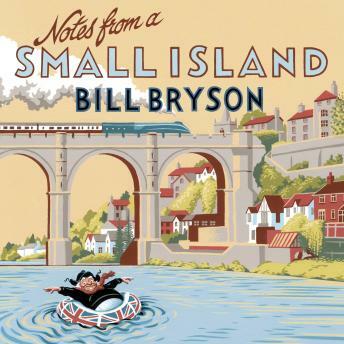 So in Notes from a Small Island, Bryson turns a laconic but affectionate eye on his adopted country. Britain will never seem the same again. Bill Bryson is funny and interesting. I know that some people hate his voice, I happen to enjoy it. It adds to his quirky sense of humor. Classic Bill Bryson. I laughed out loud at times! Bill Bryson has a way with bringing you on the trip with him as he moves around the public transport system of Britian. Very enjoyable. As always Bill Bryson never fails to entertain. I really like Bill Bryson books and although I really like his travel books, I didn't find as detail as I have his other travel books. His sense of humor helps me understand what it would really be like to visit some of the places he mentions. I'll continue to read his books as I will never travel as much as he does, but will get a sense of the place through his eyes and humor which seem to be along the same waves as mine. A wonderfully funny book and hearing the author read it was even better than reading it myself. Don't be fooled by the music that swells up at odd times; the book isn't over (and the music will go away). A great summertime book for the long drive to the lake or beach. Perhaps it helps to be English or to have lived in England for a longish time to really appreciate Bryson's wry observations, droll commentary and no punches pulled opinions. For those of us who fit that criterion, the book is an absolute gem as Bryson gives eloquent voice to our thoughts and feelings about the Highlands, the Fens and Dales, Dover, Brit rail and Calais shopping. Hw writes like the Anglophile he is and can point out warts and scars that only a lover would know. When I first started listening, I was immediately reminded of David Sedaris. Their styles are very similar and quite enjoyable. This is a laugh-out-loud kind of book and kept me smiling all the way through. Bill Byrson is as witty as ever. And this also could double as a 'real person' travelogue -- found myself wanting to map my own UK trip using the book as a travel guide. however I did not love this book. As I have never been to Britain, it could certainly just be that I couldn't relate. His typical dry humor was present, I just couldn't keep my mind on it. Anyway, I just don't think this was his best work. Not bad but worth a listen. I am a big fan of bill bryson, having listened to Walk in the woods, Sunburned Country and Short History, and think the man is hilarious. But this one couldn't keep my interest. When it was slapsticky, or very mean, it was funny, but i found myself not really listening to it most of the time, and just wanting to be done with it. Listen to A Walk in the Woods or In a Sunburned Country if you have never listened to Bill Bryson before. Sorry I can't be more specific about what I didn't like, but I just don't remember any of the book, and I think that says something.